When your nonprofit is preparing to reach out to potential donors or strengthen relationships with the supporters already in your donor database, you want to ensure that you approach each individual effectively. Wealth screening provides information on your donors’ capacities to give, strengthening your fundraising strategy by helping you determine the right gifts to ask for. 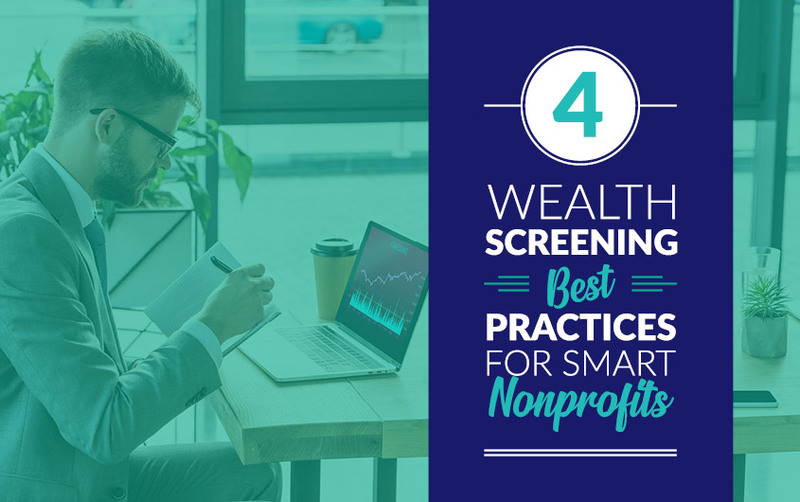 To conduct wealth screening, your organization submits lists of prospects or donors to a screening company that researches each donor, returning your nonprofit information on their capacities to give and their likelihood of doing so. Because many organizations have extensive donor databases, wealth screening is often conducted in large batches. Clean up your database for the best wealth screening results. Conduct wealth screening in segments to reach your nonprofit’s goals. Prioritize philanthropic indicators in addition to wealth markers. Manually verify your wealth screening results. Your existing donor database is one of the best places to start when conducting a wealth screening, especially if your nonprofit is looking to increase giving or identify prospective major donors. Before you submit your data to your wealth screening company, you will benefit from cleaning up your donor database. 1. Clean up your database for the best wealth screening results. The best wealth screening results come from the best original donor data, meaning the most accurate information your nonprofit has on each of the donors currently in your database. Ensure that you are receiving the most useful screening results by screening a donor database that is detailed and organized. Keep track of all recent donor activity. Your nonprofit wants to obtain wealth screening information on as many donors as possible, so make sure that you enter all of your donors into your database and record the gifts they make. Ideally, you’re already using a CRM or other integrated database platform that automatically reports and records these transactions. Maintain up-to-date addresses, emails, and phone numbers for your donors. Not only does this help ensure the accuracy of your wealth screening results, but it also provides you with multiple ways to contact your supporters and determine which methods appeal to different groups of donors. Ensure that your data entry method is both accurate and efficient. With a fast and easy data entry method, you’ll maintain an organized donor database that requires minimal cleanup before you submit its contents to your wealth screening company. Before submitting your donor database, ensure that you have removed any duplicate entries. Missing some key pieces of information on your donors? Wealth screening with DonorSearch can provide you with essential data including addresses, emails, phone numbers, ages and birthdates, and additional demographic data. Your nonprofit can add this information to your donor database and use it to reach out to your supporters more effectively. To ensure that your fundraising team is using their time efficiently, your organization will want to remove any deceased donors from your database. Your DonorSearch screening can identify deceased supporters so that you can remove them from your communication lists. The contact and demographic information that your DonorSearch screening provides, combined with the data on your donors’ past giving histories stored in your database, can help you determine the best ways of reaching out to different groups of donors. To make the most of your wealth screening results, segment your donor database before submitting it for screening. 2. Conduct wealth screening in segments to reach your nonprofit’s goals. To obtain screening data that’s ready for your nonprofit to incorporate into targeted communications and to ensure fast processing, it is best to segment your donor database before submitting each grouping of donors for screening. When your nonprofit conducts wealth screening in targeted segments, you’ll be able to identify and prioritize the donors whose attributes align best with your current fundraising effort. Recurring donors. Find out whether you’re asking them for the appropriate size gifts. Attendees from your most recent event. Determine who among them is most worth reaching out to. First-time donors. Develop your asking strategy by learning more before you approach them. Lapsed supporters. Revise your communication method to regain their interest. However you choose to segment your donors prior to submitting their information for wealth screening, your screening results are going to provide you with large amounts of data across several categories for each donor. You’ll make the best use of this information if you sort it to show the pieces of data in which you’re most interested at the top of each screening result column. Just as you can segment your donor database before submitting your donors’ information for screening, you can sort your screening results to identify the donors who you want to prioritize in your fundraising effort. If you’re looking for donors with the potential to give major gifts, wealth screening data indicating business affiliations, significant real estate ownership, and large gifts to political campaigns or other nonprofits in the past can help you create a category of donors to reach out to for major giving. Using DonorSearch, you can search your results for the criteria most relevant to your nonprofit’s current effort and create custom lists of the donors who seem most likely to help you reach your goals. After you create these lists, save them using the My Portfolio feature, making them easy to find, search, and share with members of your fundraising team. My Portfolio allows you to export your lists to Excel and PDF formats so that you and your team don’t need to be online to access them. Several of the search criteria your nonprofit are likely to use frequently when organizing your wealth screening data are those that relate to previous gift sizes. Past giving history is one of the most important indicators of future support for your organization, which is why DonorSearch incorporates philanthropic indicators into your wealth screening results. 3. Prioritize philanthropic indicators in addition to wealth markers. The number-one predictor of a donor’s future support for your nonprofit is whether they have given to you in the past. Past giving to your organization also helps to identify potential major donors among the segment of your donor database who are capable of making these gifts, while donations to other nonprofits indicate a likelihood of support across giving levels. Your nonprofit will want to prioritize donors whose wealth screening data indicates that they are active as philanthropists. Demonstrated records of philanthropic activity, especially toward your nonprofit or other organizations that share your mission or express similar values, indicate that these donors value your nonprofit and understand that contributions from donors like them are essential to the continuation of your work. Knowing a donor’s affinity to donate to your organization, in combination with their capacity to give, helps you determine how to ask them for gifts in addition to the gift size for which you should ask. DonorSearch is the only wealth screening company that incorporates philanthropic indicators into the screening process. You can organize your donors into different categories based on their combinations of giving affinities and capacities, using your wealth screening data to structure your approach to each group of donors. Using the Executive Analysis reporting feature, you can observe giving trends among the donors and prospects you submit for screening and share this information with members of your team. Executive Analysis reports are customizable, allowing you to focus on selected data, and display that information in easily understood visual formats. Organizations tend to submit large batches of donors or prospects to their wealth screening company. Your nonprofit needs fast and accurate information, especially on groups of donors such as event attendees or patients at healthcare organizations whose transactions with you otherwise risk being brief. If you want to verify selected batch screening results before reaching out to those individuals, conduct assessments to ensure that you have the most accurate data possible. 4. Manually verify your wealth screening results. Assessments, or manual verification, improves the accuracy of even the most reliable prospect research data returned to you from your screening service. DonorSearch is the only wealth screening company that offers manual verification of your selected results. Take advantage of assessments to ensure that your information is completely accurate before you reach out to donors and prospects. Active philanthropists. Past giving to your nonprofit and to other similar organizations is the top indicator of future giving, so you should prioritize reaching out to the active philanthropists in your donor database after you ensure the accuracy of your screening data on them. Contributors to political campaigns. Looking for potential major donors? A history of political giving is a reliable indicator of wealth and demonstrates a willingness to give. Use a political contribution search tool to verify this information on donors in your database before approaching them regarding larger gifts. Owners of significant real estate. Like political giving, real estate ownership—especially exceeding $1.2 million—is a trustworthy wealth marker indicating that a donor has the potential to contribute a major or otherwise significant gift. Assessing these donors’ screening results helps ensure that your understanding of their financial status is accurate. Your board members or trustees. Because they are wealthy and have demonstrated their commitment to your organization, your board members or trustees are excellent prospects to screen and assess. Their networks can be just as valuable as sources for potential donors. You can use DonorSearch’s Inner Circle function to identify prospects close to your board members and then have their data assessed as well. Assessing your donors and prospects ensures that you will have the highest quality information available to use when developing or revising your approach to asking them for gifts. Wealth screening data helps your nonprofit understand your donors’ individual reasons for supporting your organization in addition to the types of gifts you should expect from them. This understanding will lead to lasting and beneficial relationships between your nonprofit and your donors. Wealth screening data, especially that which takes your donors’ past giving histories into account, makes your nonprofit’s fundraising efforts more successful by informing your approach to different groups of donors. 6 Prospect Development Strategies for Professionals Once you have identified key prospects, such as potential major donors, communicate with them effectively using these guidelines. Prospect Generators: 4 Essential Tips to Find New Donors Learn to use a prospect generator, a useful tool for identifying additional supporters for your organization. Nonprofit Annual Reports: 7 Best Practices Communicating your organization’s yearly progress can attract prospective donors and encourage current donors to increase their support.